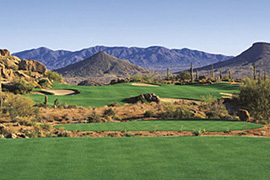 Breath-taking scenery, challenging design and first-class service make Troon North Arizona’s finest two-course facility. The Monument was designed by the team of legendary golfer, Tom Weiskopf and architect, Jay Morrish, and stretches to 7,028 yards and a par 72. It presents a challenging layout for the pros, as well as an enjoyable experience for the average golfer. 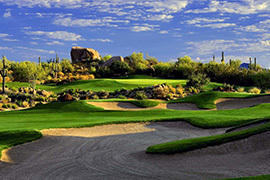 Both will enjoy the wide fairways that wind through lush desert vegetation, natural washes and towering saguaros. 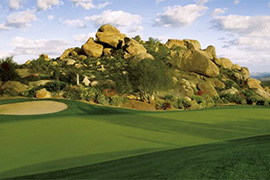 At 7,044 yards and a par 72, Weiskopf’s Pinnacle Golf Course is a worthy companion to his previous masterpiece. Built around dramatic granite boulders and striking elevation changes, The Pinnacle features a more traditional desert layout with tighter landing areas and spectacular carries over desert washes.